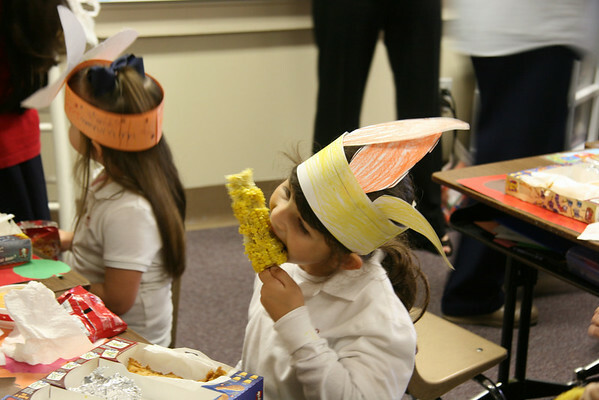 Annelise's class celebrated Thanksgiving a little early with a feast much like the original pilgrims and Indians did so many years ago. Instead of typical Thanksgiving fare the moms decided on ordering these laptop meals from KFC. Inside each box were two chicken strips, corn on the cob, mac n cheese, and Teddy Grahams. They were quite convenient to just set out on the desks and everything was ready freddie when they came back from PE. But they were also very beige with only a dash of yellow. Annelise, however, didn't seem to mind. for about 5 seconds. Germs, sherms and all that. After lunch it was time to do a craft. 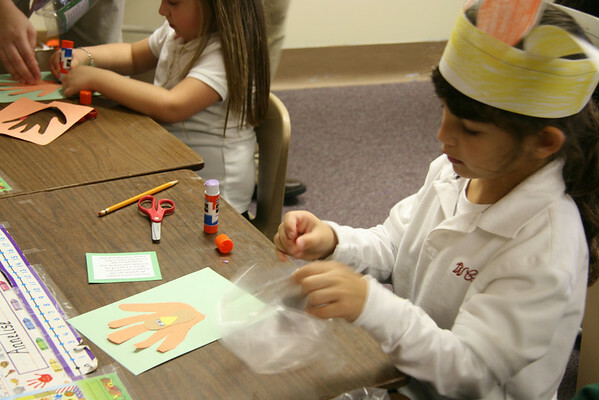 One of the totally brilliant and organized moms had individual baggies with all the supplies needed for each child to make a cute hand print turkey with a poem. We then had yummy desserts like homemade apple pie and pumpkin squares with cream cheese frosting which some talented moms made. No pictures because I was too busy licking my plate. I declared I could NOT be left alone with those pumpkin bars. They were scandalous I tell you, scandalous. We finished up the party with a Thanksgiving story. And I brought forks. And napkins. And small plates. Sheesh, the things we do for our children. Wow, that seems like a big-budget class party, how did that work? 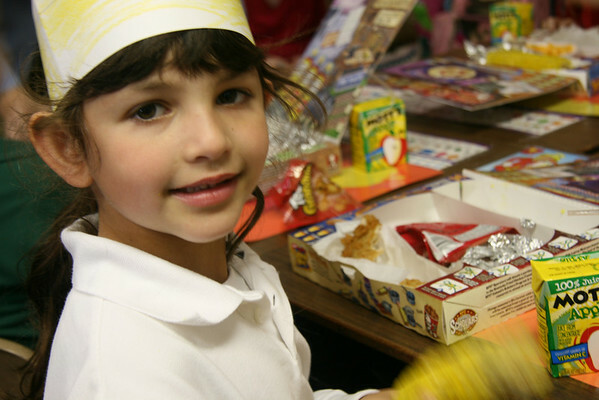 Maybe we're just all scrapping by in Utah or something, but we never have class parties with food brought in from somewhere--my kids would love that! Hey, I just got the deluxe good mail you sent me, thanks so much!!! Jill is cracking me up! Griffin's feast was today-- Chick fil a chicken platters were brought in (as opposed to a turkey, you know). Griffin and I sent in cornbread. They had veggies, etc too. The room moms (NOT me this year) dyed t-shirts for the class and helped them paint Native American symbols on them so each child wore that. They made bracelets out of beads and feathers. It was so cute! In the past we've always had a sign-up sheet and parents have sent in party type finger food (not really Thanksgiving-y, but still). A long time ack her Mother's Day Out school did a big feast--real Thanksgiving stuff-and it was nice but way over the top. This year one of the moms mentioned each child sending in $4.00 to buy these KFC laptop meals, so that's what we did. It was easy! The kids seemed to like it--although I wish there had at least been some green beens or some green/fresh veggie. Oh well. Sounds like a fun day. 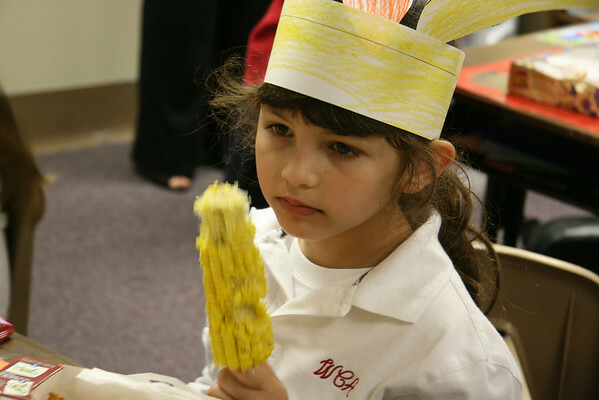 My kindergartener has a t-giving program today. This is my third year in a row to attend, thanks to ridiculously close child-spacing (or lack of spacing, depending on how you look at it). I am already singing the Albequerque turkey song in my head. I'll spare you. The first grade has a feast next week. I volunteered to bring the turkey sandwiches. I don't know what I was thinking. I feel like the world is trying to oust Thanksgiving. I am happy elementary schools haven't! I just love thanksgiving parties & crafts & the whole bit... it's even better when someone else puts it all together!! woo hooo- bonus!